Is Intel about to lose in the Ultrabook market? Much has been said about Intel’s new Ultrabook form factor. 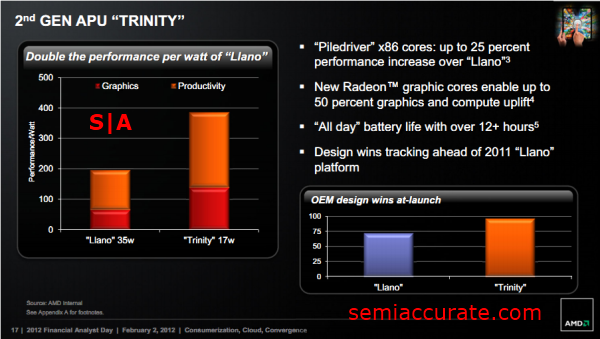 But new details from AMD’s Financial Analyst Day are radically changing the prospective competitive landscape that 2012 has to offer. During Intel’s Q3 conference call certain Intel executives were confident that AMD would always be offering a lower cost alternative to Intel products. But it seems that thing are not turning out the way that the cunning marketeers behind Intel’s “visibly smart” 2nd generation Core processors had hoped. The upcoming Ivy bridge product from Intel is going to be heavily targeting the Ultrabook form factor that Intel has almost single handedly created over the past year, not to be confused with the Macbook Air (TM). But it seems that AMD’s counter offering, in the form of its 17 Watt Trinity APUs, may end up being more competitive in this market space than Intel had anticipated. 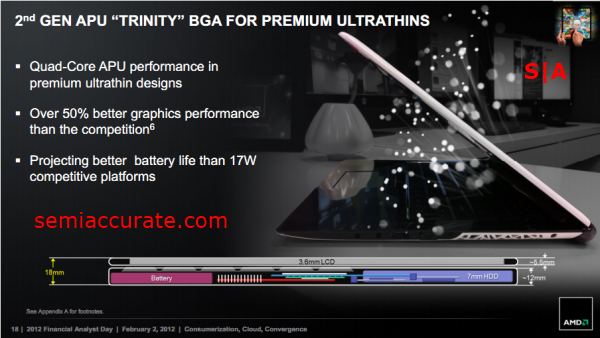 AMD is projecting that its Trinity based products, which they’ve had in hand since last June’s AFDS, will offer longer battery life in the 18mm “ultrabook” or ultrathin form factor than Intel’s Ivy Bridge. (Editor’s note: Ultrabook is a Trademarked name belonging to Intel, the generic category is Ultrathin which would cover most laptops of a sub 18mm thickness.) Trinity will also be offering 50% more GPU horse power, have quad core models, and AMD’s HSA architectural enhancements. AMD looks extremely well positioned to not only compete in Ultrabook space, but take the initiative from Intel by offering a product that can outperform and last longer than Intel’s competitive products, all at equal or lower prices. How big is the Kepler/GK104 die?